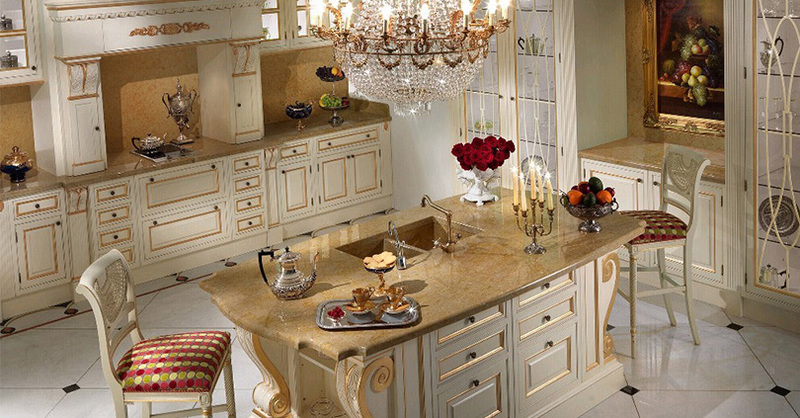 Exclusive Italian luxury kitchen for your home? Francesco Molon’s prestigious collection, wholly dedicated to this intimate and unique space of the house, guarantees the typical excellence of Italian production with an unmistakable, timeless style able to perfectly fit in every environment. Different styles, finishes, colors, materials and atmospheres are able to interpret the flawlessness that is so typical of a high-quality Italian luxury kitchen, and that is why Francesco Molon’s wide range of solutions can meet each customer’s needs and the requirements of every interior design project. Italian luxury kitchen | Alycia: a typical composition from the Eclectica collection, it is made of Zebrano wood and is available with vertical or horizontal grain. The smoothly lacquered doors reflect the absolute simplicity of the composition but also its luxurious appeal, enhanced by the visual contrast and material effect. Italian luxury kitchen | Roses: made of Makassar ebony, this reinterpretation of the 1950s typical Italian design features a curvilinear approach designed by Carlo Mollino, and rooted in the free flow of curved lines reminiscent of Art Nouveau. A genuinely architectural kitchen with a strong personality, focusing on symmetry and maple inlays. Italian luxury kitchen | Perla: this sleek solution designed for the Eclectica collection is characterized by an exclusive, original modern curved counter integrated into a cozy, rustic context. The strong charm of this unique setting is created by the visual effects of lights and shades on the back panel, and on the reflecting LED lights located at the base of the kitchen. Italian luxury kitchen | Ivory: very emblematic of the most classic style, this elegance kitchen is perfect for those who love superior-looking furniture and meticulous craftsmanship. The delicate ivory lacquer is paired with a sturdy central island, supported on all four sides by columns with carved corbels in treble clef. Italian luxury kitchen | Unyca: this peculiar interpretation of the original Eclectica kitchen is made of Ebony Makassar and offered with a myriad of different options for complete customization: from vertical grained doors to recessed handles, to finishes. A distinctive element of this exclusive work of art resides in the portal framing the columns: dramatic and beautiful, it guarantees complete uniqueness to the entire ensemble. Get in touch with the experts of Francesco Molon now for the perfect kitchen for your home.